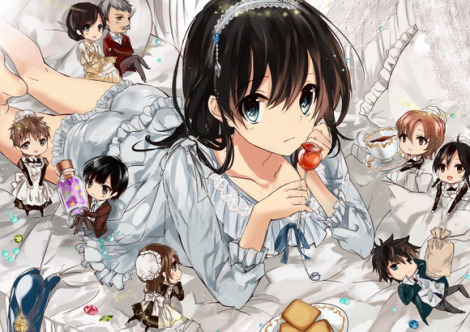 I, Seiren Shikino grew up in an orphanage. On the day of my high school graduation, I somehow got transported to another world, and turned into a girl as well. ……Eh, this isn’t my original world and gender, right!? It seems that I’m now Seiren, the daughter of a noble from another world. This is a light hearted story about family and romance. A surprisingly nice story. Mainly SoL, generally lighthearted exploration of MC's new situation. Not much comedy, though. Some reviewers criticized the GB theme, and complained how MC accepted the change so quickly. IMO not everyone has a dire attachment to their old lives. There are many who can change and adapt to a new situation. Overall well written by the author; generally good translations by both translators. Many people's self-perception is tied to their own body. Consider the common story of teenagers who start suffering from acne, or the stories of people who... more>> become crippled in some way. Even the stories of long -term employees who lose their jobs. Don't they change? Ok, this is a story about a guy who is born in a noble household in a medieval setting but, after 1 month, he was magically transported away from his home and sent into the future (basically to modern times). After spending 18 years growing up in an orphanage and graduating high school he's finally magically summoned back to his time by his parents who found a wizard to bring him back, they re-unite, , and the story starts. Well, it the process of the summoning his gender changes... more>> to that of a girl but, well, that's the risks of time traveling! It's not every day you come across a story where the MC is summoned (or re-summoned) by his original parents. So that's something new I think, but there's problems as well, IMO. The translator does a great job, but the story is, well, I'm dropping it and all because of the MC. Firstly, why make a gender swapping character when he was already originally girly even as a boy? He doesn't go through any of the conflicts that most boys would go through if they're suddenly forced to live as girls. Wearing dresses without complaint even though he never wore them before, letting the maid bathe him just because that's how noble girls have their baths done... this in itself might not sound bad in itself but keep in mind he really didn't want to, not complaining about the high heels even though he was AFRAID of tripping in those things when walking down some stairs, and etc. Really, why make the MC originally a guy that then becomes a girl when his personality is already that of a, well, girl and a very passive one at that? Alice Tale did this too, what's funny or interesting about going through the added effort of making your character a gender bender if he adjusts to his new gender without any issues at all? And then there's his personality, or lack thereof. He's passive, he's very passive, he's just so freaking passive with everyone about everything. I've already read stories about passive MCs 101 times, I'll admit I tend not to like them, but this guy takes it to a whole new level... but, ok, not everyone has a problem with passive MCs so let me mention the extent he takes it to. Even though he grew up in modern times he let's his parents dictate everything to him, doesn't even stand up for himself in front of the servants like I mentioned in the spoilers, and even accepts it when his maid mentions that his parents will arrange a marriage for him in the future... even though he's mentally a man! And not gay! And spent the first 18 years of his life in modern times! This guy is a complete 100% doormat. And the worst thing is that he doesn't like some of this stuff (including the likely future arranged marriage) but the most he can do about it is lightly (yes, LIGHTLY) complain about it in his head. He's not just a beta, he's a cuck. I acknowledge that part of the reason I gave such a low rating is because I hate passive MCs but he takes it to such an absurd level that I don't think I'll be the only one face-palming at this. Now, we're only 15 chapters in so we haven't seen how the MC more modern education impacts things yet, all the other characters seem to be written OK from what I can tell, and as for the MC's parents I'm actually glad they have medieval values... they're not bad people and they clearly love the MC, they just have different values. Unfortunately, the one guy in the series here with modern values is an utter doormat that's too much of a wimp to stand up for anything, so a lot of opportunities for conflict was flushed down the toilet and I see ALOT of wasted potential. I expect something from his/her lessons with the old man, meanwhile 2/5 is all it deserves. What a interesting concept with exceptional execution. We have a poor orphan boy ready to set on the world only to set into a different not as a boy but as it should of always been a young miss. It's a good story that most wouldn't want to miss. This is quite an interesting story, probably the best Gender Bender I've read so far. The main selling point of this IMO, is how the MC actually looks like someone that has been through a huge change on his to her life, being thrown into a different world with different gender all of a sudden and having to adapt to a totally new reality is quite a shock for sure, and the author does an excellent job in exploring that. So far the story isn't really all that captivating for me, it's just MC getting used to her new life. However I suspect that there'll be development in some kind of plot in the next few chapters relating to the previous world. The gender bender aspect is not really all that focused on in the WN so far, it's just MC having a few insecurities due to the change in his gender and it doesn't really talk about them in much detail. So, I started off this novel with high prospects. but well, it started off good, and then selves into the usual Japanese archetype and generics. A passive MC, who does nothing and comes as it goes. Legit, the MC barely speaks, she/he thinks more about furniture and how a castle rooms decorated then actually speaking sentences. The other characters are actually more interesting than the MC. They try to get him to fit in and talk to him and reconnect, but since he’s so passive. It all just feels fake and just a... more>> mere joke. And when something happens in this new world, you’d think the first thing he does is to go and tell the people who honestly care about him. But no. He doesn’t, he f**king just stalls it all out and acts all passive. He SHE. Has to be the most passive character I’ve ever read about. i honestly thought the little brother was an interesting character, I thought he disliked his new sister, and was going to have drama. And it’s be this whole, “I’m your sister. I’ll try to be a good sister! And look out for you!” Like cute sibling sh*t.
but it turns out the brother is a tsundere or some sh*t. And then things get boring real quick. im tired of Japanese stories detailing castle architecture and furniture. I know it’s good to be descriptive. But ones attention mustnt always be on architecture. I'd like to start of by saying that I found this stories beginning to be quite unique which initially captured my interest. Unfortunately I had to give this story a 2 star rating due to the fact that it has an interesting beginning, but a very uninteresting MC imo. Like some of the other reviews here I personally agree that the MC who came from a modern society such as ours, is much to passive. Things that we today would find abhorrent and would likely fight tooth and nail to prevent,... more>> (s) he simply meekly accepts. The people around the MC know that he came from another world, yet not one of them asks about it. Not about what it was like or anything. The only thing they learn in passing mind you, is that he grew up in a commoner lifestyle. Which doesn't tell them much at all. I mean come on... if it was me i'd be asking a million questions! After finished reading chapter 4, this story seem to be a light-hearted one with a very optimistic protagonist. Well, I still can't say anything much about this since there's still no actual plot revealed. As for chapter 3... well there's not much going on but I think it has quite a potential. There's not much Slice of Life novel with Gender Bender twist in it to begin with. So we can look forward into it in the future when more chapter is released. For now 4/5 is suffice since I'm looking forward to the future. Slow story more focused on Drama than what you'd expect from an Isekai or Gender Bending story. It's about the very passive MC coming to terms with being a daughter of a noble, learning about the world, and finding out what she should do. No action, no Isekai OP power, very plain Drama with an Isekai/Gender Bender flavour. I'd rate it 2.5 Stars if possible. Usually I like isekai story but this one, I don't really like it. The MC is too weak in many place. I know the MC is a girl when he/she born but.. the way he/she act is make me wonder where the heck is his 18 years lived as boys experience? ?